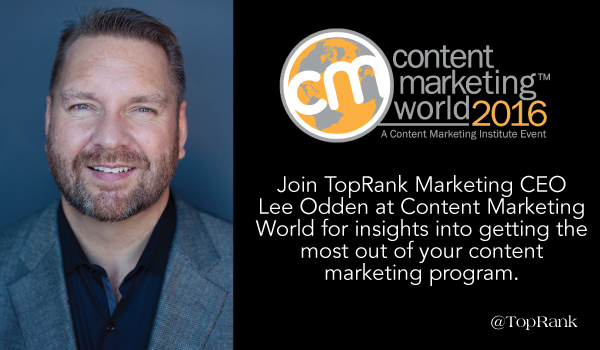 After only a week back on Minneapolis soil, TopRank Marketing CEO Lee Odden will be setting off for the biggest content marketing conference on the globe; Content Marketing World. This year, Lee will be presenting not once, but twice at the 2016 Content Marketing World conference. Over the past few years, Content Marketing World has grown to epic proportions. In fact, last year there were 3.500 attendees from 55 countries (and they are expecting even more this year). Attendees for the conference will gain access to over 80 sessions and workshops to choose from that cover everything related to content. When you have that many options, sometimes it’s hard to figure out exactly which sessions to attend. To make your choice a little easier, below are the details for both of Lee’s sessions at Content Marketing World. How to get the most out of outsourced content partners and optimize your digital marketing agency investment. CMI and MarketingProfs report 76% of B2B marketers will produce more content in 2016 and B2C marketers are allocating 32% of their total marketing budget to content marketing. For many brands that want to scale quality content for marketing, agencies can serve an important role, but there are often functional disconnects and inefficiencies in the client agency dynamic resulting in unmet needs, unrealistic expectations and poor performance. Executives have a challenging role in B2B today, even more so when it comes to developing content marketing strategies. What makes one organization’s content better or more effective than the other? What areas to do executives need to focus on to ensure their organizations are not only meeting buyer needs, but exceeding them from first engagement through to customer advocacy. Ask the panel of marketing experts what needs to be put in place to have a successful content strategy from an executive perspective to drive revenue and maximize customer lifetime value. Note -this is not your marketing manager’s session. This session will deliver insights into executive challenges and provide an opportunity for live Q&A with a few of the best in the industry. What is the executive’s role in driving a buyer-first content strategy? For those of you attending (and even those of you that can’t make it) we will be providing blog coverage of Content Marketing World on TopRankBlog.com. You can also follow @TopRank, @leeodden and @azeckman on Twitter for live updates.